Selectivity in fish, especially trout, has always been heralded as a mark of intelligence particularly among dry fly anglers. Each time a trout spurns our offering and compels us to change flies we consider that rejection as a mark of superior intelligence or at least very great discernment. This allows us big-brained humans [?] to feel less humiliated by a cold-blooded creature with a brain that's smaller than a pea! While I enjoy fishing for trout that are feeding on a specific insect I believe that they are not the smart ones but the dumb ones. Several years ago I spent a considerable amount of time investigating the subject of selectivity in trout. I read most of the available literature on the subject, and carefully considered all of the popular theories. Since we have yet to find a talking trout all our carefully and logically derived conclusions are really just smoke and mirrors. Quite frankly we don't know why trout feed selectively, but we have made many educated guesses. Fisheries biologists will tell you that selectively is not a mark of intelligence since given the size of the trout's brain it is very unlikely that a trout ever processes any information in a logical manner. The parts of the trout's brain that are most highly developed are those related to non-cognitive functions like breathing, swimming and fleeing. They are not Einstein or even Frankenstein. It is safe to say that the trout that turned up its nose at your carefully tied mayfly pattern only to eat some miniscule bit of flotsam too small for you to see was not rejecting you due to intelligence but something far more primal. A trout that is feeding selectively is like a person that only eats tofu. It's not great, but it's filling, so every meal is only tofu. When a big juicy steak is offered to them they refuse it and just continue to eat tofu. Intelligence choice? If you think so your intelligence level is very close to that of a trout. In a nutshell that is how selectivity works. Trout start feeding on a specific form of food but when presented with an equally edible and nutritious food form they continue to feed 'selectively' on whatever they have previously been consuming. They chose tofu over a steak. Trout that are feeding randomly are actually far more difficult to catch than trout that are feeding selectively. Once you have figured out what selective trout are feeding on the rest is, as Sherlock Holmes would say, 'elementary my dear Watson.' Random feeders are the truly difficult ones, the salad bar trout that are sampling a little of this and a little of that, but seldom the same thing twice. 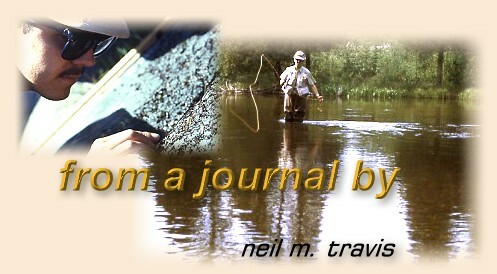 Several years ago I chanced upon a situation on a well-known trout stream that illustrates my point. During the day a steady hatch of small olive mayflies produced a nearly continual rise, and having 'gotten their number' I had been consistently catching trout. As the sun began to set I chanced upon a dozen or so real good fish feeding along a grassy bank. Suddenly the game changed. They were not interested in any form of the small olive mayfly that had been so productive during the day, and after changing flies several times I waded below the steadily rising fish and sampled the surface of the water with my aquarium net. In the drift line along the bank was a steady stream of small ants, beetles, aphids, leafhoppers, and similar terrestrial insects, a potpourri of tiny delectable morsels that were being served up to the waiting trout lined up along the bank. Wading back into casting position I present the last trout in the lineup with a small jassid. Bingo, fish on. Moving up to the next fish I tried several different patterns before I got a take, and the same with all the other trout in the lineup. Each fish wanted a different fly, although stomach samples taken from several of these fish [using a stomach pump not a knife] demonstrated that they all were eating some of everything that was coming down the drift line. If they had been feeding selectively on one type of insect I would not have had to change flies for every fish I caught, but since they were feeding randomly they were rarely feeding consecutively on the same type of insect.